Most of the men hanged for their parts in the Lower Canada rebellion did not start out as rebels at arms. Heavy-handed actions by the colonial executive in denying demands for responsible government, and by the British army in response to a peaceful assembly in October 1837, pushed men to the brink. Those who paid the ultimate penalty in Lower Canada were Joseph-Narcisse Cardinal, Joseph Duquet, François-Marie-Thomas Chevalier de Lorimier, Pierre-Théophile Decoigne, François-Xavier Hamelin, Joseph-Jacques Robert, Ambroise Sanguinet, Charles Sanguinet, Amable Daunais, Charles Hindenlang, Pierre-Rémi Narbonne, and François Nicolas. Here is a brief history of several of them. One of those at the October assembly was Joseph Narcisse Cardinal (February 8, 1808-December 21, 1838), a notary, school trustee, militia officer, and member of the legislative assembly. Like most of the men eventually hanged for treason, he first tried to bring responsible government to Lower Canada through peaceful means. Though he did not fight in any of the battles of 1837, he fled to Vermont at the urging of family. There he met the Patriote leader Dr. Robert Nelson. He convinced Cardinal that a viable rebel army was in place in America with plenty of weapons and support from Americans. Cardinal returned to his village of Châteauguay and joined the Frères-Chasseurs secret society. When the uprising began November 3, 1838, Cardinal took command of local rebels as a brigadier-general. The next day, he took a detachment of Patriotes to the local Mohawk reserve to take their weapons. The natives, ever loyal to the Queen, arrested Cardinal and his men and turned them over to the army. He hanged as part of the first group of Patriotes. Joseph Duquet (September 18, 1815 – December 21, 1838) was a notary who studied under Cardinal in Châteauguay. After the November 1837 uprising, Duquet helped his uncle, wanted by the British, to escape to the United States. Duquet joined Nelson's first raid on the colony in February 1838. Following a general amnesty for most rebels, Duquet returned to Châteauguay where he helped found the local lodge of the Frères-Chasseurs. Duquet took part in Cardinal's ill-fated attempt to get weapons from the Mohawks. Arrested with Cardinal, he joined him on the gallows. François-Marie-Thomas Chevalier de Lorimier (December 27, 1803 – February 15, 1839) was a notary in Montreal. When the rebellion began, he joined 200 men in Saint-Eustache who tried to hold of an army eight times their number. De Lorimier escaped just before the final British assault. He fled to the United States. He was at General Nelson's side during the brief invasion in February 1838. He next took part in the November 1838 uprising at Beauharnois and fought in a skirmish several days later in which the Patriotes drove away a British detachment. Several days later, when the British won the upper hand, he fled and was caught near the American border. 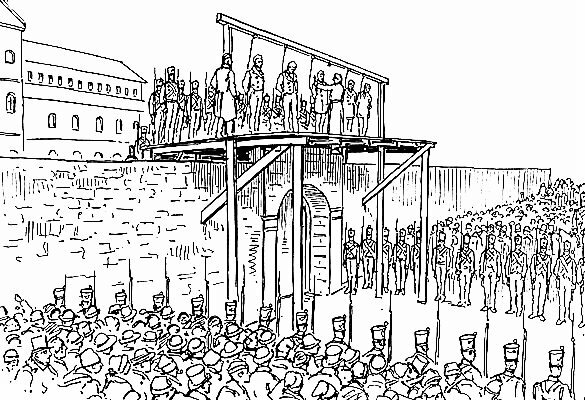 He hanged as part of the third group of convicted Patriotes. Pierre-Théophile Decoigne (March 13, 1808-January 18, 1839) was a notary. He joined the Frères-Chasseurs in September 1838 and he captained rebel troops in the November uprising near Napierville. The British captured him as he fled to America. 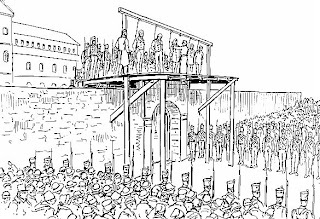 He hanged as part of the second group of convicted Patriotes. Charles Hindenlang (March 29, 1810-February 15, 1839) was born in Paris and served in the French army. He moved to the United States and was drawn into the Patriote rebellion, where he offered to teach battle tactics to Nelson's troops. He faced defeat with Robert Nelson at the battle of Odelltown and was captured as he fled to America. Pierre-Rémi Narbonne (1809- February 15, 1839) was a persistent Lower Canada rebel. In November of 1837, he fought the British at the fall of St. Charles and escaped to the United States. He joined Robert Nelson in his unsuccessful raid into Quebec in February 1838. Narbonne attacked the colony again a month later as part of a small raid. Captured during that attempt, he was released in July. He promptly rejoined Nelson in Vermont. In the November 1838 raids, Narbonne was captured at the battle of Odelltown. The rebellion started by Louis-Joseph Papineau, and Wolfred and Robert Nelson took the lives of over 300 rebels, and 27 soldiers or militiamen. Louis-Joseph Papineau (October 7, 1786-September 25, 1871) stayed out of the fighting once he fled to America in November 1837. Pardoned in 1842, he returned to Canada in 1845 and was elected to the new Parliament of the unified Province of Canada in 1848. Wolfred Nelson (July 10, 1791-June 17, 1863) was captured in February 1838 and exiled to Bermuda. Pardoned, he returned to Montreal in 1842 and was elected to Parliament in 1844. In 1854, he became mayor of Montreal. As for Robert Nelson (August 8, 1794-March 1, 1873), he moved to California where he made and lost a fortune during the gold rush. In 1863, he relocated to New York City to practice medicine. Though pardoned, he never returned to Canada (except in a coffin after his death).